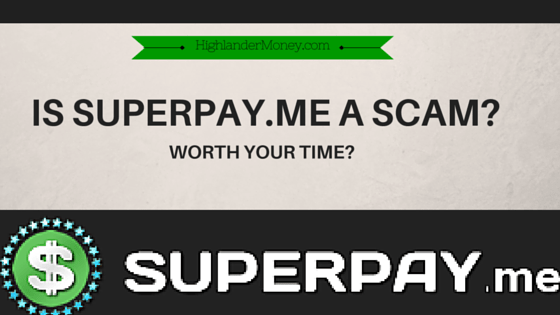 Home › Reviews › Is Superpay Me A Scam? Is SuperPay Me a Scam? Can you expect to make money with SuperPay Me? Well, we first must discuss what SuperPay Me is. SuperPay.me is what I call generally a survey site, but it has more than just surveys to fill out. It also goes by GPT site, which is an acronym for Get Paid To. They also have Daily Tasks and Daily Surveys to complete along with Watching Videos, Paid To Click(PTC), CPC, Quick Submits, Trial Offers, etc. They openly post how many members (400,000) the currently have along with the total amount of money paid out ($500,000). Which I’m surprised it isn’t more popular considering the benefits compared to other comparable sites. There are two methods of payment offered by their advertisers one is the holy grail (cash), the other is points. Different advertisers pay differently, so be mindful of that. Cash is easy to understand, while the points method is easy too, with 1 point = $0.01. So 1 point is 1 cent, you need a hundred points to make $1.00. But also too, under the Rewards tab, you can convert points into cash and cash into rewards, under Convert Points & Cash. Another great thing is the minimum cash-out payment is only $1.00. Most sites are $10.00 or $15.00 dollars and some even as high as $30.00, but not here it’s a buck! Surveys – On average the payouts for surveys completed are between $.40 and $1.50 but can go much higher for some surveys. The amount of pay is usually determined by the amount of time it takes you to complete the survey. A 20-minute survey is going to pay more than a 5-minute survey. This is where you’ll make the most money at here at SuperPay.me. Paid To Click – Not going to make the most money here, but it sure is easy. Just click the advertisement and a new screen will pop up. Then allow the page to load, and at the top of the screen in black it will show you when you have been credited and you can click the Return to SuperPay to SuperPay.me. It’s a 10 second wait time. The pay can be a $.01 to $.0001. Told you, it wasn’t much! Referral – Everyone that signs up through your affiliate link, you earn 25% of everything they receive for life. How great is that? So, try and get friends and family involved or if you have a blog or website openly promote Superpay.me to earn additional income passively. Only $1.00 to request payout, probably the lowest in the field. It’s amazing for this type of site. Some sites require a minimum of $30.00 to get a payout. A real positive. Great Affiliate program, with a 25% of what the person you referred makes. Very generous! I would greatly appreciate you signing up under me on Superpay.me and this would support this site. Join Superpay.me now. Many methods of receiving payments. PayPal, Payza, Skrill, amazon.com, and bitcoin. Shoutbox is a great tool that runs on the side of the screen to chat and ask questions, ask moderators for the best offers and ways to earn. Very friendly and helpful. Take advantage of this. You can receive payment in a little as 4 hours and sometimes up to 24 hours. Super fast payment!!!!! SuperPay.me also has contests, which are daily, weekly, monthly, and yearly for hard cash. If you are within the Top 20 who earn, then you are entered to win cash. They have promo codes that they put on Facebook and Twitter, enter these codes for easy points. Confusing and unnecessary two types of offers, Cash, and points. Depending on the advertiser is what you will be credited with. Points are only good for Amazon Gift Cards. While Cash can be transferred via Paypal, Payza, Bitcoin or Skrill. Will charge you 2% for Paypal and Skrill and 3% for Payza to cover payment processor fees. Some offers take 30 days to credit. OMG, Becky! As with all survey sites don’t expect to get rich doing them. Expect to make some money though. Must be 18 years of age in order to participate. This would be great for younger teenagers to use if they allowed a younger age. Return on your time isn’t generally reciprocated via pay. Soul-killing after doing your 30th survey. Probably the most important advice to pass on is to clear your browser cookies, Every time something credits! Just like most survey sites, this is uber important to do this, so you will be credited for every offer you complete. SuperPay.me recommends ccleaner program to clear cookies. You can download the free version CCleaner download. I have used this program in the past and does a great job. Leave the completed page open for a few minutes to allow for the credits to be credited to you. Weekdays are better than weekends for finding offers. Be honest. Use your correct information. Peanut Labs & OfferWalls is the popular ways to earn on SuperPay Me. Follow them on Facebook or Twitter to get promo codes from SuperPay.me to get easy points. This really seems to be a growing market in the GPT and surveys sites, judging by the amount in existence. I haven’t used all of these but might in the future, but if you are interested here is a list. Dealspotr – I really like how easy it is to make money on this site and it’s different than survey sites, Join Dealspotr here or Read my review, What Is Dealspotr About? It’s for people that need to supplement their income, but don’t expect it to take the place of a second job. As I have always thought about surveys sites, you can make money in your spare time. Like, instead of watching TV or reading you could be earning some dough doing surveys. Or if you are a teenager looking to make extra money for whatever reason, it’s also a fantastic way to earn money without getting a job and just doing it in your spare time. When you first sign up for SuperPay.me you will receive three emails, in those emails. With those three simple emails, you can get steam-rolling and get you started earning money right away. Welcome To SuperPay.Me – Basic Information with a link to the Quick Start Guide. A must read. The first method of support here is the obvious Shoutbox chat platform on every screen. You can ask members or Moderators questions, and they will steer you in the right directions. Every Moderator I chatted with was extremely helpful. Another method of connecting with Superpay.me is through their Contact Us page located at the bottom of every screen. So finding help here, isn’t hard at all. This site is free they pay you. Is SuperPay Me A Scam? No, they pay and in my opinion on SuperPay.me, it is a general good survey site, but with that, keeping in mind all survey sites are income limited, in that you basically won’t earn enough money. They have nice features like Shoutbox, surveys and other means of earning money, but their affiliate program is great and the best I have seen compared to their peers, like Inboxdollars, instaGC, and others. It comes down to the individual and their financial needs. But you will not get scammed because they do pay and with lowest payout requirement in the field. It’s one of the better in my opinion in terms of options of surveys sites. So feel free to Join Up Now. If you want more earning potential check out my review of Wealthy Affiliate. Where you learn how to build a successful online business. They even have a Free Starter Membership. If you are looking for another 100% legit way to make money, by owning your own online business. It provides the best training online along with the most helpful and friendly community online, with all the needed support to get you building your online business. I recommend you read my #1 Recommended Program and sign up to get started today. If you have any questions or comments, I would love to hear them below. Thanks. Not legit ! They ripped me of Twice . Won’t answer my email mails correctly ! I have heard of complaints for being kicked from Superpay.me as providing conflicting survey answers. This is the only conclusion I can draw from you comment or being hacked. Maybe in time they will get to your support ticket. I see no other way around this. Have you tried making money on Dealspotr? I find it easier to make money – less tedious and pays better. One door closes another one opens. I love using Dealspotr and would use it more often if I didn’t have websites to attend to create content for. You can read my review of Dealspotr here, What Is Dealspotr About? I have a video on my review of how to post deals on Dealspotr as well. Hey Mike, thanks for the information. I am wondering was there cheating going on? Where did you find out about this? Are you banned? Sounds very suspicious, I don’t see a site getting rid of people for no reason. Any more information would be greatly appreciated. Just an FYI points can be converted to cash. 1 point=1 cent. As for the bans, most were glitches due to some sort of IP6 error and 99% of members were back in a few hours. Hey Raven, thanks for clearing that up about the bans. I know it was reported that a couple of days ago here, a lot of people got banned. Glad it’s just a computer error. Also thanks for the point information, I will post that above in the post. Why do they need access to your bank? They have other method of payments, PayPal, Skrill, Payza, Amazon.com, and Bitcoin. I see no bank deposits option. I am trying to withdraw a $1.00 through PayPal right now and I will see how it goes. I don’t see where they ask for any identifaction other than PayPal email address. Let me know what method you are using and on what page if I am mistaken. Thanks. I received the money through PayPal with no problem what so ever from SuperPayMe.com. So, don’t know what is going on your end of the deal, but I requested payment and in about an hour received payment. I’m new to it. I went to transfer 1.35 from the site into my Pay Pal. It is in their terms that identification verification may be required. If not immediately then maybe later. They hit me up as soon as I requested a withdraw. They said they needed one form of ID, which could include a utility statement with a recent date, but might ask for a second form. To save time I sent them two forms making sure to black out my DL number and my bank account number. It wasn’t a big deal to me. I guess it keeps people from using multiple accounts, which is better for their clients. One thing you did not mention is their referral program which in my opinion makes the site possibly heads and shoulders above the most popular sites because for every new person that signs up using your referral link, you get paid 25% of what each of your referrals earn, so potential to earn cash is there even if you do not actively participate in their offers. How has it been working for you after a full year? I also found the sending of identification a little troublesome to me. As I was unsure of doing this at first but after doing it, it wasn’t that big of a deal. They do have a decent referral program and if you can get some referrals under do so. To answer your question it been decent not mind blowing but decent. Hope this helps. I have also never had a problem EVER getting my money from them. Thanks Paula for sharing your positive feedback. SOUNDS LIKE SUPER PAY.ME HAVE HIGH STANDARDS AND WANT TO KEEP THEY’RE END UP I’m IN.. They are a decent company, I’ve always been paid on time. I no longer do this kind of work online, I have more profitable ways of earning than this, but this is a safe bet to use. One word of advise to anyone who asks me about superpay.me & That word is AVOID! Most disgusting, Scamming and time wasting company i have EVER came across and in my day i’v come across A LOT of organised crime websites just like this one. This is how it works: They let you sign up and they will even let you earn little offers ($0.01 – $1) which seems great, So just by that you would assume they are legit and trustworthy but this is where they get you as when you actually pay for one of their ‘offers’ what they in fact do is have a system in place to block you as soon as you earn a select amount or even complete an offer that you must pay for, The next step is they claim they need to ‘verify’ this (Which they claim takes 2 months, Never in my life have i heard so much rubbish/trash), This is to hold your money for as long as physically possible to try and make you forget or simply give up, If you do not give up they simply state you are a ‘multiple’ account and secretly have this in the terms that any multiple accounts will be blocked (You will be blocked even if you have no multiple accounts, They simply claim to have ‘proof’ which you will never get and your Account, Money & Time is lost. Do NOT fall for it, The company is one big scam and you will never earn with this website, My advise to everyone would be to go outside and state at the wall as you will earn more money doing this then you ever will with a website like superpay.me! Thank you for sharing your experience with Superpay.me. I have never had a problem like you have had. When I requested my money I got it a day or so, I don’t remember the exact amount of time but it wasn’t a month or two. I also agree with you, as I state in the review, that you’re not going to be making a lot of money here. There are far better options for that. Check out my list on the top of the page but you can earn extra spending money. I have personally requested payment and haven’t been blocked. Someone else claimed this awhile back. To check I requested a payment and wasn’t kicked. Did they give you a reason why you were kicked? Did you receive your money? Try to find out why they kicked you and get back to me with the reason. I am still an active member and everything is working for me. They do not block your account. They do lock it on the support ticket page until you verify with identification. It usualy takes less than a few hours or sooner after you send it in. Why do you say it is fake? I’ve taken money out of here twice with no problem. Thanks for adding your positive experience, as this will help other people determine its legitimacy. As stated above I totally agree with you, as my experience is similar to your experience. I am having trouble getting them to pay me. Every time I request payment they tell me they have to get verification from the surveys that I have done. It sounds to me as though they are actually looking for a way to get out of paying anything. Not only that but when you do get information after putting in a “trouble ticket” you can find spelling mistakes. I’m just wondering who owns this site.